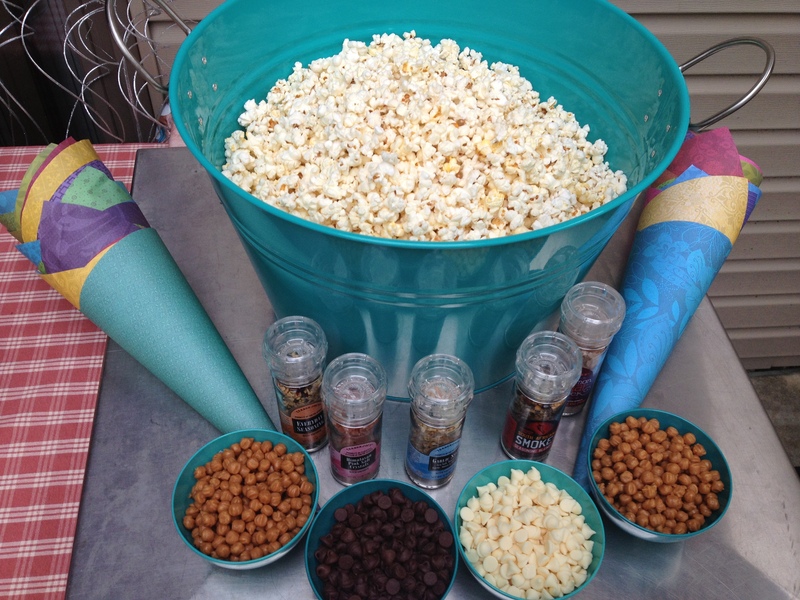 Holiday Party or Game Night Idea: Popcorn Bar! Ah well, the popcorn bar was a huge hit when we saved everything and used it at our going away party before we moved. I think this would also work really well as a snack set up for a holiday or game watching party. It can easily be dressed up or dressed down to suit your occasion. For the wedding, the plan was to use multicolored vases to hold the cones and coordinated dishes for all of the toppings. It was easily “dressed down” for our picnic going away party by serving the popcorn in a beverage tub and the toppings in coordinated plastic dishes. Rather than having a bunch of bowls to keep track of and wash, we rolled multicolored scrapbook paper into cones and sealed with a sticker. For the holidays, you can use holiday scrapbook paper and for game night, printing the teams’ logos on regular printer paper for the cones would be nice touch. Really anything you can throw on to popcorn will work. I’ve always loved the look of holiday M&Ms and if you have fresh herbs or chives around, those would work, too. The whole idea is to play with flavors and get creative!